My name is Richard and I am a chocoholic. If there was a 12-step program for chocoholics, I guess I just passed the first step. Paris has some of the best chocolate shops in the world and I can sniff out a new one faster than a drug sniffing German Shepard can find a kilo of cocaine at Charles de Gaulle airport. I received a hot new lead the other day and sniffed my way to Galler, a spanking brand-new chocolate shop only open two day so far in the Marais. 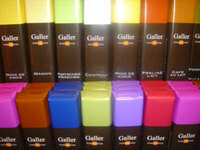 Jean Galler is a Belgian chocolate maker and the best way to describe him is the quote from the brochure: “In these chocolates I put the very best beans, the purest ingredients and 30 years of passion…” He has stores all over the world is careful and rigorous when choosing his franchises. A very pleasant, jovial Belgian man named Koen is the owner of this franchise. He was kind enough to offer me some samples, possibly a major mistake on his part, as he unknowingly became an enabler to a chocolate sample addict. As I bit into the cocoa dusted dark tubular shaped truffle, I knew I had hit the jackpot. Smooth, rich and intense, I had to have more. I shamelessly played my I –am– a- journalist-want-to-do-a-story-on-you card on him, and he took the bait as he generously fed me more samples. Next up in the tasting parade was a pretty white chocolate disc with stripes of forest green and ocean blue. 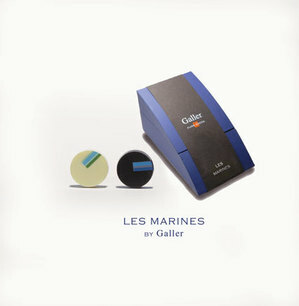 It was part of the new line called Les Marines, which are inspired by the sea and contain 2 exotic kinds of sea salt and 2 algae infused in the chocolate: Wakami & Nori(the algaes), and Sel noir d’Hawaii & Fleur de Sel de Guerande(sea salt). I have always been a chocolate and salt fan and this was a refreshing and satisfying taste sensation. Last but not least, Koen unveiled his latest product, which was his pride and joy, called Kaori. 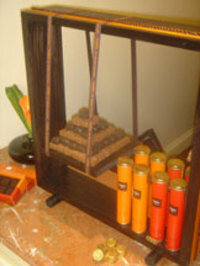 Kaori is a handsome box of 6 kinds of thin ganache chocolate sticks laced with unusual flavors of saffron, cardamom, Yuzu fruit (a Japanese citrus like grapefruit), ginger, vanilla & cocoa and strawberry & balsamic vinegar. As if that wasn’t exotic enough, the box comes with 4 small “pots” of crushed orange peels, macha tea, poppy seeds, and Kalamansi fruit and you are supposed to dip the chocolate sticks into the pots. As I dipped away, the taste was divine, rich and subtle with small bursts of fruit and spice. I loved this clever and sophisticated idea and will definitely be giving this as a gift at dinner parties. The shop is inviting with warm vanilla colored walls and salmon and brown flecked marble counters. The handsome packaging is mostly in Hermes colored orange boxes and tins. Other products include macaroons, chocolate mousse in Dixie cups, and delicate short bread cookies. 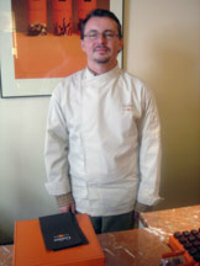 Just to let you know, I was a chocolatier myself in New York before I moved to Paris. I made my own line of Belgian chocolate truffles and had a shop called Rich Treats off of Fifth Ave. in Manhattan. Here's another one to try. Backtrack along R des blancs manteaux and turn right (north) on R des Archives. Across the street is Jadis et Gourmande, another chocoholic's delight. thanks for the recommendation. I do know that place and the chocolate is good there too. As a die-hard chocolic, I love hearing about new shops. Will add to my list of chocolatiers to check out. Have had their bars but not bonbons. I have a strong preference for french chocolate but will try any quality chocolat. As always, lovely pictures. Please continue to inform us of new shops and new locations of favorites, like Mulot in the Marais. We made a Les Potes Carte de Rencontre for the gay male market in Paris, perhaps we should make one for the Chocoholic. On my travels as a chocoholic i look for local chocolate shop, i love to experience the local taste, i definitely will visit the shop next time I'm in Paris.